I promised earlier that I would share a tutorial for planning a hexagon alphabet quilt, so here goes! Keep in mind that I’m by no means a professional quilter, I’m just sharing my own process hoping it might be useful for someone. I printed off some hexagon graph paper and started to mark out a pattern. Working with hexagons rather than squares was a bit challenging at first, especially spacing and fitting hexagon designs onto a square quilt. But once you have the graph paper it's totally doable! Of course you can make all sorts of designs, not just letters. Google and Pinterest are great sources of inspiration here. 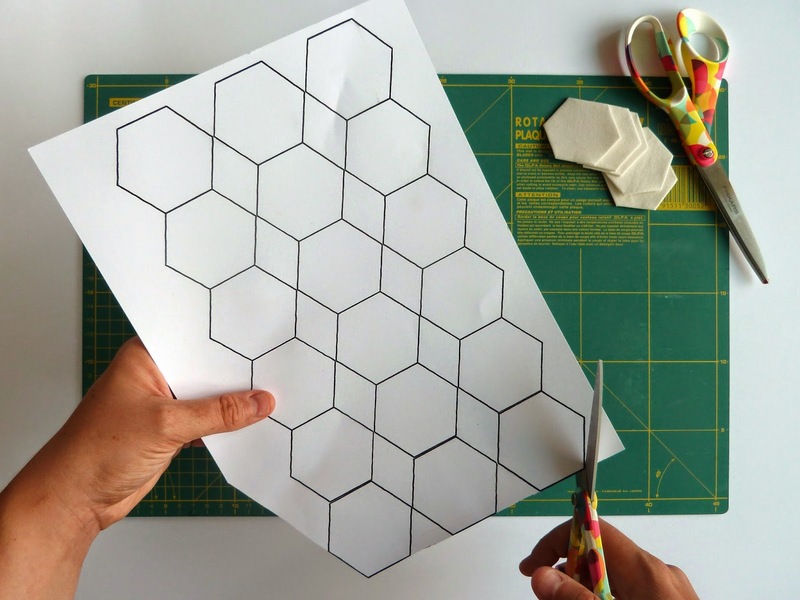 Just print some graph paper and start brainstorming – the possibilities are endless! With the finished design marked out on my graph paper, I ended up with a rectangle that was 37 hexagons long by 27 hexagons wide. The next step was to decide on a size for the individual hexagons. I wanted a lap sized quilt, but figuring out what size hexies I would need to reach that end result was tricky! In the end I decided to use hexies that are slightly larger than 1 inch (2,86 cm to be exact) on each side, which given my pattern will make a quilt that is roughly 53 x 63 inches (134 x 160 cm) when completed. You can choose any size hexie for this project, but keep in mind that hexagons are not square (duh) so calculating the size of the finished quilt is a little finicky. If you have a very specific end measurement in mind, break out your calculator! So you have your your pattern completed – next you need your templates! If you’ve chosen a common hexagon size like 1” or 2”, you can buy ready-made templates at your local quilting shop or online. But if you’re like me and you ended up with an oddly specific number, this is a great site that lets you input the size of your hexagon and makes a PDF graph paper based on hexies that exact size. Perfect! The I just printed the templates onto a sturdy cardstock and cut the templates out using scissors. Keep in mind that a lap quilt using 1 inch hexies can mean around 1000 individual hexagons (my quilt uses 978 hexies), so if you want to prep all your pieces before you start sewing them together you will need A LOT of paper templates. I started a sort of printing-and-cutting assembly line in my living room and made about half of the templates in one go, but of course if you start to assemble and sew your hexies right away that will free up some templates to use several times over. Whichever way works for you! I hope you found this tutorial useful! I will continue to post my progress on my own hexagon quilt as I go along. If you decide to make one, I would love to see! Just drop a note in the comments. Edited to add: This blog post originally had an image of the diagram I'm using for my own alphabet quilt, but I have removed it as Tilde of the Inklingo sampler felt that it was too close to her Inklingo quilt design. Naturally I don't want to offend anyone so I took the diagrams down - my apologies to anyone who came here looking for them. But again, a quick Google image search should give you lots of inspiration for planning your own alphabet or any other design. Best of luck!